Well, hi there and welcome. This is Stuart Zadel, CEO of Zadel Property Education, and I want to welcome you to the start of 2019. I hope you’ve had a fantastic break. I hope you had a great time with your family, friends and loved ones, and a safe one, and you’re charged and ready to go for 2019. Now in this quick video I want to address some of the changes coming up this year at ZPE and also what you can expect from us, and just a few ideas of this year moving forward, and the things that I’m thinking about. So I’m going to use the flipchart here and we’re just going to get into it. So the first thing I want to talk to you about this year is the global situation – political, financial, and every other way. So the thing for this year is you need to play a fantastic defense. You know, to be a fantastic sporting team (many of you know my background was in football or soccer) – and I often think of the Brazilian football team – well regarded as one of the best, often greatest footballing nations in the world in recent times. So their offense was fantastic, but what was lacking? Their defense. Now, many of you might go back to the ’98 World Cup in France which I remember because I was there where Australia got knocked out by Italy, I believe it was, through a very dubious decision there. But what the Italians had in that World Cup was an incredible defense. Now they might not have had the most attacking flair of football, but the defense definitely won them the game. So in 2019, you need an incredible defense, ladies and gentlemen. We have a very interesting situation worldwide right now politically, financially, debt-wise, corporate, government and personal, and a lot of interesting things are going to happen because debt does not go away. So you need to play a fantastic offense as well. What does that mean? It means getting your financial house in order. Offense means to go out and make money. It means to start a business, get a strategy, find a system that you can use to make money with leverage either in addition to your job or regular income, or to start a new business altogether, or to add on to your current business. So the thing is, we’re always trying to play a great offense and make money, but this year, defense is going to be even more important. So keep that thing in mind as we go ahead. Now, it’s the start of the year, if you haven’t already, I know we are here in the office, you want to set maybe some targets or some goals and have some direction for 2019 and moving ahead. Probably many people would say the single greatest success secret there is, if there is one, and that is to set goals. You want to set them generally in the 7 areas of your life – financially, physically, health-wise, family, mental development goals, spiritual development goals, maybe community, and there’s a couple of others you can think of as well. So here at ZPE, we definitely got them as well and we’re keeping this thing in mind. Now remember, the whole game is to turn what we call ‘active income’… now active income is generally income you got in exchange your time for money for. For most people, that would be a job. They work for it. Now for many people, that is still a business as well. If you’re a self-employed business owner like an accountant or a professional or something, you’re the one doing the work. Last night, I was watching the tennis. The Australian Open is on and Nadal beat the new Aussie up-and-coming star Alex. Those guys are fantastic, they earn incredible money, yeah, but guess what? They front up on that court with injuries and everything and they’ve got to play. So that’s active income and they know they can’t do that forever. So they have to make their money now while they can, and/or turn that active income into passive income. So someone like Nadal, I saw his shoes, on the back of it the heel showed it’s got “Rafa”. He’s got his own clothing line now. So whilst he’s being active, he’s generating massive passive income on the side as well and hopefully that income will continue long after his career is over. Now, you may not be a famous world-class tennis player or athlete. Well, property is a great thing, isn’t it? We know we can earn active income through our jobs and our businesses and then we can funnel that into property done well with leverage, borrowings, and smart way and we can leverage that and turn it into passive income by renting it out and have someone else manage for it. One of the hottest strategies is Airbnb. 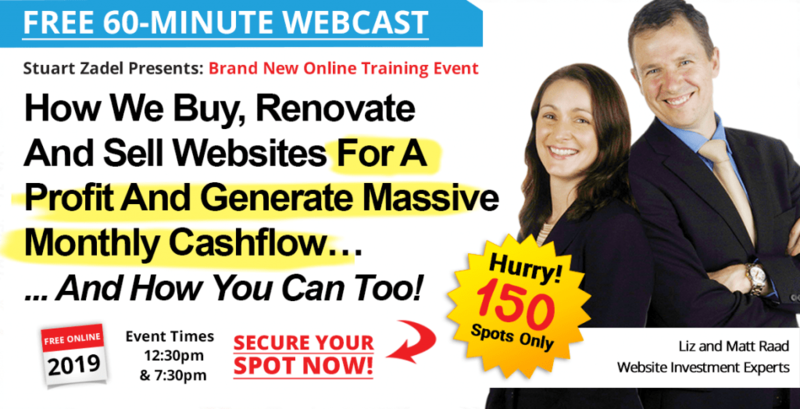 You don’t even need the money and you can start to generate passive income. Some people might be doing Airbnb right now and you might be doing 100 percent of the work on the active column and that doesn’t work for you. So that generally is going to require systems, training and leverage, and maybe other people to do it. And that’s okay. We can pay people a lower hourly amount to do work that we get paid more money for to do the work that we love. So the whole theme of the year, you want to be thinking “How do I turn my active income into passive income?” You do that over a lifetime, you’ll be fine by retirement age and we know retirement is a dumb year as well. Now, how are we doing that at ZPE here? Well, you may have noticed we are known and famous for our live events. And about 3 or 4 years back we held about 99 events in 1 year… I had more frequent flyer miles than I would ever use in my lifetime (except I got a bit worried about them and I cashed them in as well). The answer is the web and we’re going to call that webinars or webcasts. So here at ZPE we are going to be focussing heavily on doing online education. There’s a great book out there by Eli Goldratt called The Choice and he’s also written a book called The Goal and he talks about the theory of constraints. The theory is, you know, if your main income source got removed, how would you generate an income today? So our income source or our method has been live events. If that got removed completely, how would we continue to function? And the answer is digital and webinars and worldwide. So we can actually now reach the whole of Australia much more effectively. We’ve got a lot of people. A lot of people don’t want to live in the cities anymore, there’s mass migration out of the cities. Of course, there’s mass immigration into the country which goes to the big cities, but a lot of locals are moving out of the cities for a better lifestyle, avoid the traffic and pollution and all that sort of stuff. So we’re following our own advice. We’re going from active to passive and we’re going from live to webinars. You’re going to see that more and more. Now, that doesn’t mean there won’t be live events, and we’ll notify you when and if there is, but for now, you can rest assured we’re going to be doing that. And there’s some very exciting announcements coming! We’ve got some incredible new strategies coming online this year that you’ll be taking advantage of through the webinar situation, no doubt. Now I’ve got a couple more things to talk to you about, which I think is really important to pay interest to. … And I beg you to start using cash. There’s a worldwide trend they’re trying to eliminate cash. Why is that? Well, the global financial situation is very interesting and maybe they don’t want cash out there. Wait ’till that idea gets to Australia or the States which could be coming this year. Very interesting situation. But those people have their digits in a bank account and of course on the 14th of February, Valentine’s Day last year, your government brought in Bail-in Laws in Australia that gives them the power under emergency circumstances to confiscate bank accounts in this country to offset the debts of, let’s face it, our fraudulent banking system which has come to light in the Royal Commission. So yeah, we don’t need to get upset about this stuff. We know the game that’s going on. What I think you want to do is have a balance between your digital and your physical. Precious metals, fantastic, gold and silver… many people would say precious artwork or fine artwork. Your buying price is great but there’s a bubble in fine artwork just like there is in most other things in the world these days. But these things are physical. Tools are very, very valuable. Something I’ve never had in my life but I’m now acquiring is physical high-quality tools that you can use for maintenance and on the land with, and do stuff with… grow stuff with can be a form of wealth. Far better than being digital money in a bank account, if you’re actually going to need them one day! Maybe you want to have fuel or water or food? This is an example of having physical wealth. You see, most people have a completely digital life these days. They use a tap and go card on everything, they don’t carry cash anymore, all their money is in a bank account and they’ve got no physical stuff or assets. Now, in a stable system, that’s fine. That’s fantastic. It’s convenient, it’s easy, and that’s how they get it, isn’t it? But who says it’s a stable system right now? The GFC came and everyone thinks everything is fine. No, no, the problems are 10 times bigger. The banks that were too big to fail, they’re 10 times bigger, they’ve consolidated and they’re in worse financial shape than they were then. So it’s going to be interesting to see what happens. And I don’t know if you want all your life in the digital realm. So for many of you, it’s going to be about rebalancing into the physical as well and I recommend you think about that. Now, some of you are completing the physical and you want to get into the digital. You might want to take onboard maybe some of the strategies we’re going to present this year, things around websites and things like Amazon and a whole lot of things that can be done online. This was never available to your parents, your parents’ parents, because the internet, it’s only just clocked over being a teenager. This thing is just getting started and the opportunities out there globally without constraints… as Goldratt said, you now have a national and now you have a global market available to you in the click of a switch, literally. All our great Pay It Forward Members out there, we haven’t forgotten about you. The game is changing and we’ll be in touch fairly soon. And of course, we haven’t forgotten about our Top 5 Big Goals either, ladies and gentlemen. Our goal is to create a financially abundant community. We’re giving away a million dollars, we’re planting a million trees, we’re training a hundred thousand people live at our events now – they may cross over into the digital world as we’re now talking about as well. But you don’t change a decision to go. You might just have to change how you get there! So anyway, I just wanted to touch base with you at the start of this year. Thanks for your support. I think you’re going to love some of the stuff we’ve got coming and it’s getting very real, very practical which it’s always been, but even more. And I can’t wait to be in touch with you guys again soon. So I hope you’ve enjoyed this video. Think about some of the things I’ve said and some of the steps you may want to take to just round out your life for any scenario that might happen this year. Now of course if you’re in property, you know, we’ve got a federal election coming up this year as well and that’s certainly something you want to factor in. Generally, business tends to stop a month before an election depending on what happens, waiting for things to see and obviously we’ve got some big potential changes happening to property – negative gearing, capital gains tax that has been signalled by the opposition. So you want to plan for that as well this year. Alright. Cheers for now. Happy 2019 Zadel Team and see you very soon! Great job Stuart. You made me think and changed my life. You are one of my hero’s. I went To a small town called York 1 and a half hours drive from Perth last month. They have a motor car museum there at the town fantastic colection, very enjoyable to see. In that collection, they have the first Volks Wagon ever brought in to W.A. The story goes that, a German family at the end of WW2 emigrated to Australia with their VW as all the cash in the bank at the time was not worth much more than toilet paper, you needed a wheelbarrow of cash Doitchmarks to by a loaf of bread. So the family brought along their physical asset to pay their way in their new country as it was worth a lot more. So as they say, Man without history is forever a child! And: History always repeats itself because we forget and don’t remember our history. Next time you are in Perth, take a trip to York, and see the beautiful old town and museum have lunch at the old Pub. Have a prosperous New 2019! It is interesting to see how many young students want to evaluate the pro and cons of both physical and digital assets. Your series on the history of money created discussion not only amongst peers but within families as well. A re-run of that series would be of great benefit for those that missed the episodes. Your sponsored book of Napoleon Hill is going down a treat with young teenagers who are seeking a path to the future because they are receptive to your messages of inner strengths and skills. Keep up the great work of disseminating ‘real’ value, teachings and pathways to a better future.